need to put this thread on rcc too richard!!! congrats on what you have gotten soo far! pre-turbo A/I is the way to go! Nothing to report yet, just in the process of changing the turbo. After replacing the rear rotor with a non-dented one (again, pulled only the back off the engine), I dynoed with the BW turbo. 560 rwhp on 26psi. This time water flow is not restricted, nozzle is at full flow. From past experience less water made more hp, so I suppose it's a really conservative tune now. The engine sounds 10x better with a non-dented rotor haha and seems to be happy at that power level. Maybe 20+ dyno pulls at 560hp. I was about to up the boost some more but the water tank split and caused the engine to knock at peak torque! The compression reading has not changed so hopefully the engine is still good. Time will tell. BTW full boost is reached at 5500rpm. Not bad I thought for a basically stock port engine running pump gas and a full exhaust. Plus I now know that pre turbo WI makes the turbo spool slower. I don't think it will be a problem however, rpm does not drop below 6200rpm between gears. What BW are you on? S475 i think he wrote in another post. 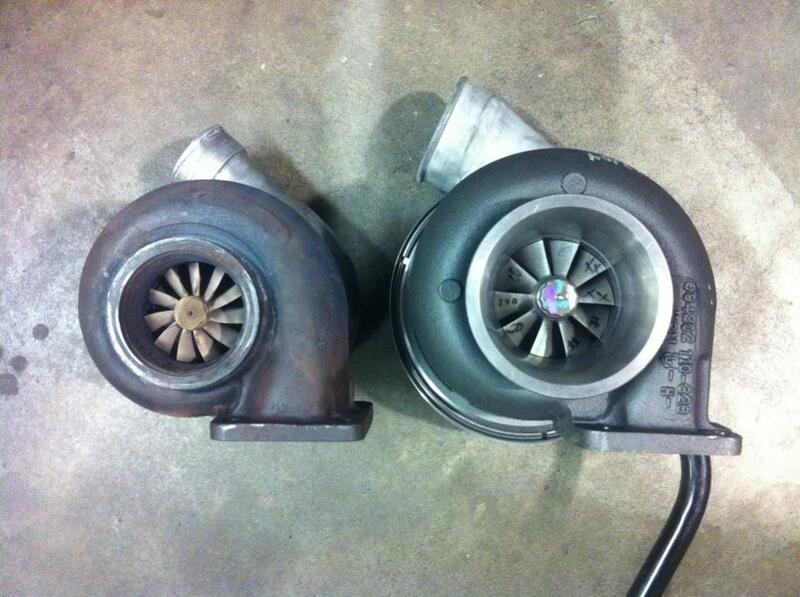 very good power .could you post the dyno graph from the old turbo comparing it to the new s475 turbo. i would like to see how the bw spools. I searched for a sec but might have missed it. Graphs would be nice to see. Did you try testing your tank before you installed it? Wondering at what PSI it split. I had my 4-qt tank from Devils Own up to 25psi testing and it held fine. Awesome numbers on the dyno. *Edit* Sorry, forgot that you were running a metal tank. Not a plastic one. Went back on the dyno quickly after repairing the WI tank and the engine is still good at the same power level. With some larger injectors I'm confident it'll go over 600rwhp easily, the engine is exceptionally quiet at this point. And yes alloy WI tank which I tested to 40psi when I made it. It split down the center of a weld, probably from the constant expansion/contraction. I'll make a thicker one later. Current boost level is 26psi. I'll scan a dyno plot with a comparison to the 60-1 turbo when I get a moment. BTW the turbo is spitting some water back out the intake at high rpm which makes me wonder if it's getting close to surge. Any ideas? Last edited by JZG; 03-09-12 at 03:44 AM. surge maybe , maybe also to much water. 9.43 A 145mph. Humidity was unusually high and air pressure very low, so the turbo wouldn't make full boost (it seems the wastegate spring must have been maxed at 26psi on the dyno). 24psi was all it would manage + I had taken ignition timing out just to be safe. The track surface was average which meant the half track times suffered. Considering the conditions I'm happy with the times. jeeeeeezzzzussssss fuuuukkkkkkknnnnnn shhhhhttttt that thing is hauling! Any pics? Wow...that thing is smooth, straight, fast. Love it! Also put it over the scales at the track out of curiosity and it weighs 2309lb. Really close to that 8 sec pass now but it may have to be done with no exhaust as I think it is becoming a restriction now. Or maybe we could pull the seats etc out. This thread dosnt get nearly enough attention.. So close to a 8sec pass. Props man. Well the final meeting of the season was a bit of a disaster. The track was not good all day and after several oil downs and timing gear problems we only got 2 runs in. The first was a 9.3 at 143 backing off due to wheel spin in the top end, and the 2nd 9.07 at 151 point something mph! So close to that 8 sec pass yet so far! Nevermind, I think I'll build a half decent engine over the off season and the plan is to switch to E85 now and give that a go as I'm curious to learn about it. Maybe I'll start a thread about it. All in all I'm real happy with the WI and pump gas. It's cheap, simple, reliable, and easy to set up. There is no compressor blade erosion at all with the Borg Warner either. In the end I got up to 590hp at the wheels but it must have a restriction somewhere as any extra boost over 28psi made no more hp at all. It still made exactly the same hp at 33psi! I'm wondering if it might be the limit of pump gas with near stock porting. Hi, I know you side your using the sua25 air atomising nozzle but would you know what part number you used for the fluid cap and air cap? Last edited by sharingan 19; 04-23-12 at 02:48 AM. Reason: removed abr. Yea that probably sounded a but weird. I'm actually really happy with the car in general considering it's the turbo setup I've done making more than 450hp. I'm very happy to go from a mid 11 second first pass to a 9.0 within one season of racing. I have no idea how E85 will go, but if nothing else it'll lower temps. I'll probably try WI with it at some point, out of curiosity. Well if anyone is interested I decided to stick with water injection and pump gas out of curiosity and a couple of days ago on the dyno made 740hp at the wheels on 36psi!! (did run a high as 38psi at one point) This was not safe hp however so it wasn't a high rpm dyno pull, and I'm fairly sure it was barely controlled pre-ignition that was making the extra power (Howard Coleman will cover this anomaly at some point). However the engine did it no trouble and we went racing the following day with a lot less power (first race of the season). To cut a long story short I ended up going in circles on the dyno so didn't really have a good tune up for racing, plus the wastegate decided to play up at the last minute so boost control was a bit hit and miss, and thanks to a crazy hot day 60ft times were 1.5 tenths slower than usual. Even so the car still ran [email protected] and that's with about 130lb more weight in the car than last time we raced (9.0 at 151). So I'm guessing about 620hp, that's about 30-40hp up from last time. This is full street trim, full interior, full exhaust, but running slick tires. So I think that once I sort out the wastegate and get a good day at the track we should be able to crack the 8 sec bracket. I'll post up the dyno sheet when I get a chance to scan it. The setup is basically the same as last season but I did build a better condition engine over the off season. Still using used parts it's still a T2 engine using T2 intake/throttle body, only I switched to 8.5 rotors and a reasonable street/extend port this time. Completely sick!!! Very badass numbers, times, and mph!!! Thats sweet man. Time to step up the intake and throttle body.